Crimson silk velvet short round cloak, the silk made in Italy, France, Spain or England. 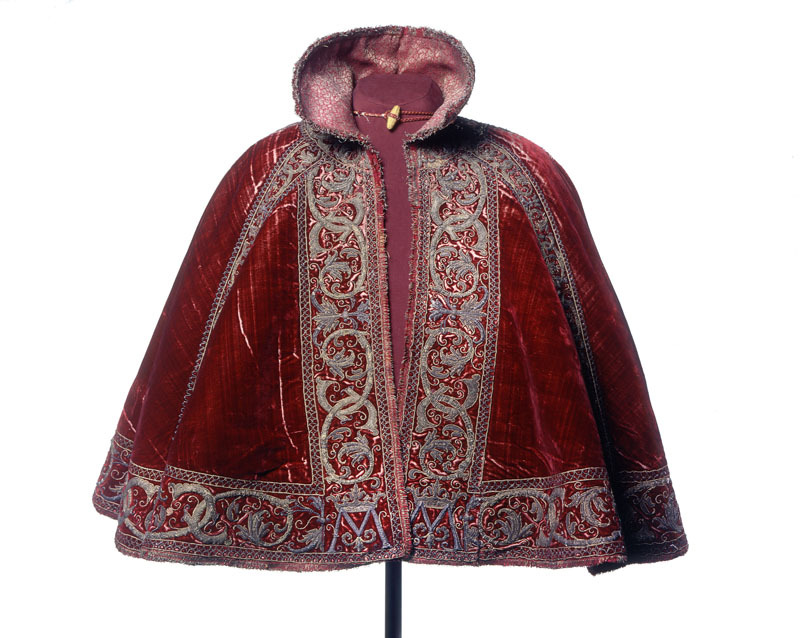 The circular cloak is arranged with the lengths of velvet joined at the centre back, and open at the centre front with selvages folded under. Small semi-circular pieces are added on both sides to give the circular shape. The velvet is arranged with the pile running up and down alternately (down on the right front and up on the left front), although there is very little nap to be seen. The embroidery is worked onto the velvet without a linen backing. 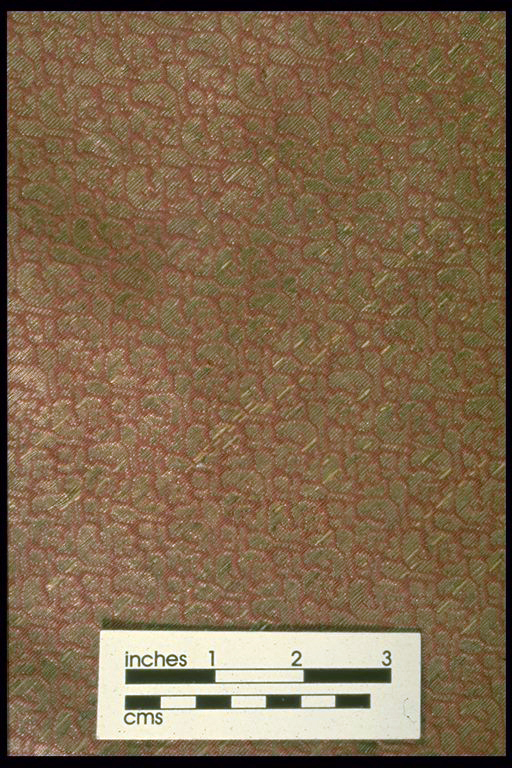 The velvet is 21 1/2" wide with bright green selvedges, ca. 1/2" wide. The original lining of light crimson silk taffeta has been cut away but a fragment remains beneath the short fringed braid and is hidden by a later lining dating from the early C17, probably stitched in in the C19 for a painter's studio. A tuck has been taken in the left front only, beneath the embroidered guard, probably to hide a slit in the velvet. Present lining is a red and gold patterned silk, characteristic of early C17. The collar is a straight strip with a small piece cut out to shape it. It has been cut about at some time and pieces of velvet fitted in; bordered with fringed braid of ca. 1/2" with same red silk and gold thread of strip wrapped round a beige silk core.